Medlock Area Neighborhood Association (MANA): Free pet adoptions in September! ATLANTA, GA -- (August 31, 2015) LifeLine Animal project invites you to celebrate fall and save lives through their “Fall in Love” promotion. 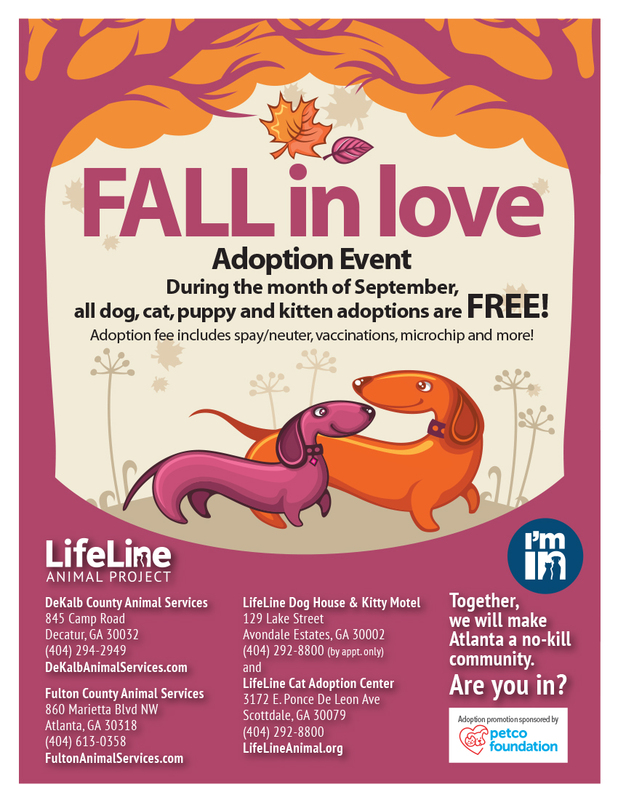 Due to the high number of animals coming into DeKalb County Animal Services (DCAS) and Fulton County Animal Services (FCAS), throughout September all dogs, puppies, cats and kittens may be adopted for FREE! In August, DCAS took in over 756 animals and FCAS took in over 660 animals. FCAS Director Lara Hudson is optimistic that the “Fall in Love” promotion will result in many homeless pets finding their forever homes. “With 30 plus animals entering the shelter daily, we urgently need public support to help us save lives, and we're hopeful that the public will step up and adopt from us” says Lara. All September, adopters will receive a dog or cat that has been spayed or neutered, has had all vaccines and is microchipped – a $250 value – for FREE! Adoption counselors will be on hand at both shelters to ensure the animals are being placed in good homes. To view animals available for adoption, or for the shelter’s address and phone number, please go to FCAS or DCAS or visit us online www.fultonanimalservices.com/adoptable-animals or www.dekalbanimalservices.com/adopt-a-pet.